created a few changes around the house. Isn’t this foo dog’s face hilarious? and decided to use them as bookends in the kitchen. brought out my green pillows again. I already had two French grain sack pillows in the closet for one sofa and purchased these two below on sale at Restoration Hardware for the other sofa. This should remain this way for at least the summer. I added new, green glass beads to the turquoise beads. Recently, a publisher sent me this audio book to review. I think you will find this entertaining. I listened to it on a long car ride. It kept me awake, smiling and even blushing during the racy parts. I was glad I was alone in the car (you might prefer to listen with head phones or the book version for that reason)! (and please follow me here or on Facebook). Or order the audio book here or hard back book here. 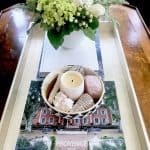 Love the new touches around your home (which is beautiful!). Summer is the best time for a light, entertaining story. Thanks for the opportunity! Lovely beads around your lamp base. Adding even little new decor details can give the right inspiration to change a few thing! Love the bookends and the indigo trow with whites and greens! Such a clean and summery look! The book sounds like fun reading… or listening! I love easy reads in the summer! You are like me in that you love to change things up a bit. I am in the process of trying to make a few summer changes. In fact I wrote about one MISTAKE I recently made in my summer room. 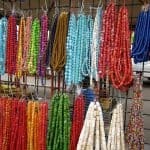 Love the green and blue beads, fun and a bit whimsical!! I love your summer spruce ups – very cute! 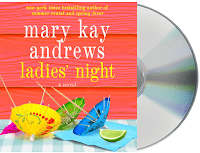 I love Mary Kay Andrews and can't wait to read her latest book. I would love to win your copy – errand running and driving is a lot more fun with a good book to enjoy! Love the new pillows, it all looks so fresh…Great idea to use the foo dogs as bookends! I would love to win the audio book..Sounds like an interesting summer read, thank you. Your new Foo dogs are wonderful but they look like the ate something sour…;) Love your apple green pillows they look so fresh. The new audio sounds like a good summer read but since I don't really like listening to books I just went and purchased the hardcover. Thanks for the recommendation! Everything looks great…still jealous about the Foo dogs. 😉 Can't believe you got those for $40.00, they are so elegant looking even with the funny expression. P.S. Any idea when your home is going to be featured in BH&G? Just curious! looks great!!! need a funny read!! I love your throw and pretty green pillow. Apple green and gray have become favorites of mine lately. The book sounds amazing. 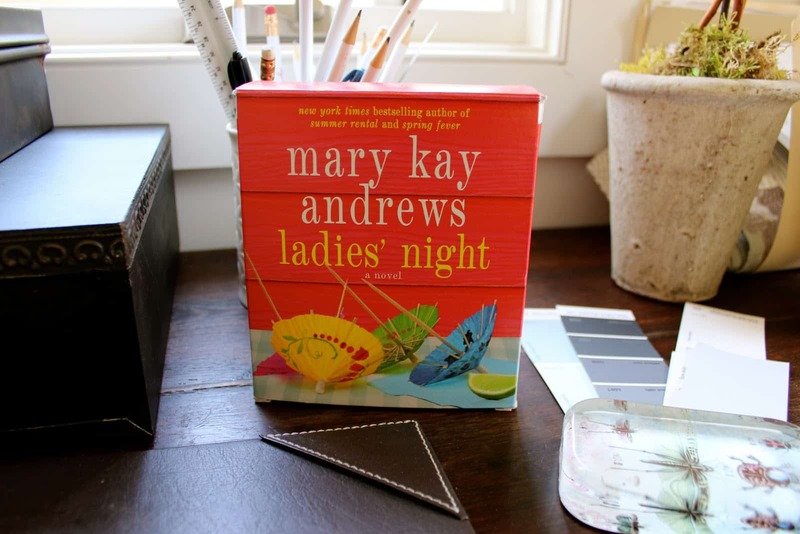 I reviewed a book of Mary Kay's books and love her writing, especially for a great weekend out of town. So light and fun! The changes look wonderful! 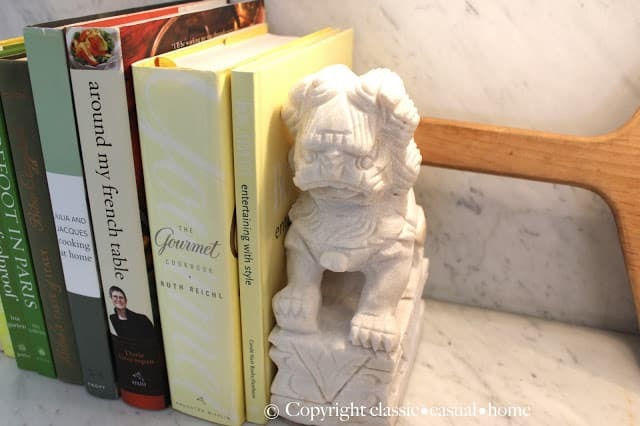 The foo dogs were an awesome find and make great bookends!! 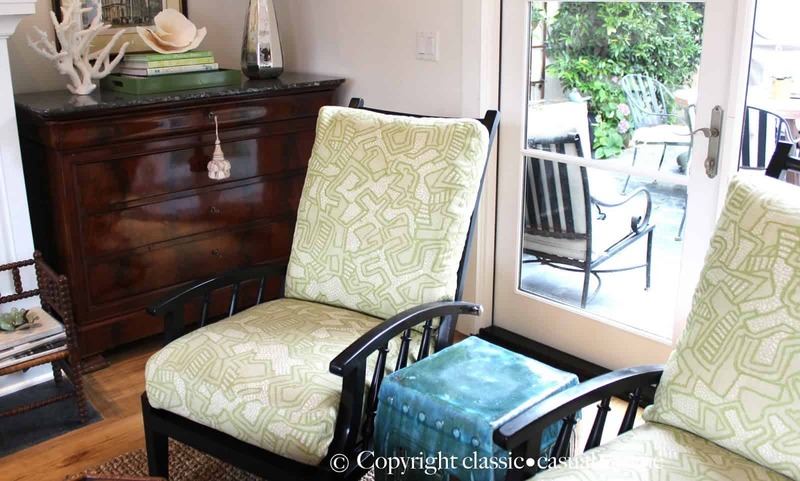 I love the pillows and would love to win the book! I love the indigo and apple colours together. They are similar to colours I'm considering for our family room. By the way, is the indigo throw from Nigeria? I lived in Nigeria when I was young and we brought back several pieces of cloth dyed a deep indigo blue like that (just a warning to keep them out of the sun, though, as our faded badly) – I love the simple on it. 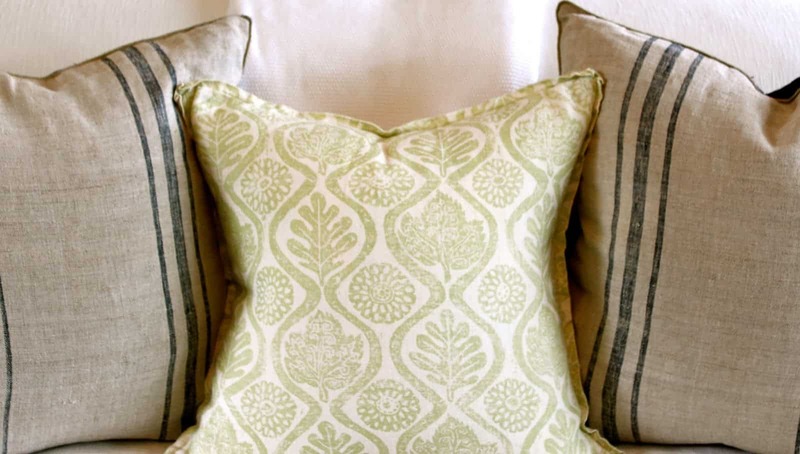 I love everything….in fact I just ordered two of those pillows from RH. Have to get the book…thanks for sharing. 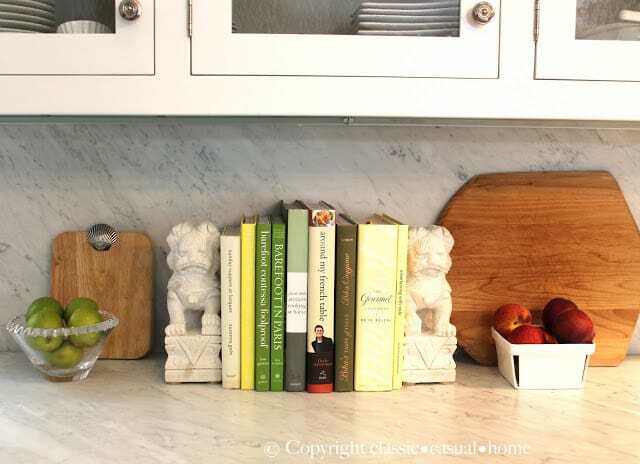 Love all your new details…the color combination is wonderful and looove those Foo dogs! Arent' those felt pads the best, I use them for everything! Loving the green and navy! That is the best thing about keeping everything else neutral:) I saw that book the other day and wondered if it was good…almost bought it for my trip to Hong Kong. Love the foo dogs, and they do have a funny (in a cute way face). Love them in your kitchen. Mary Ann, foo dog and book sound hilarious. And I've never thought of pairing indigo with apple. great combo! Loved this post! 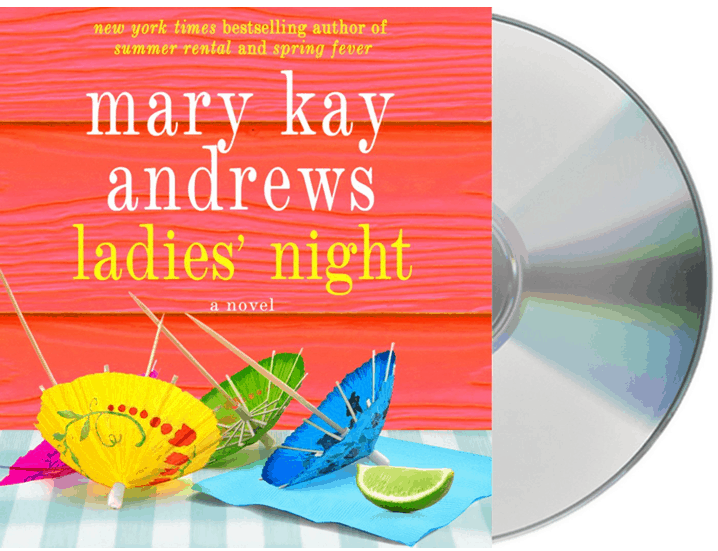 Would also love to win your audio book, sounds like a fun read (or listen)! Thanks for a chance at winning! Those foo dogs are the best! The audio book sounds great for a long summer road trip – I have a solo one coming up to pick up my daughter at camp. So jealous of your new doggies! I have been looking for a pair for a long time, these are LOVELY. My mom came for a visit this weekend, she lives in Western NC and I live on the coast. She always hates the long drive and I was encouraging her to try some books on "tape" (I know they are all on CD now, but it doesn't sound as good). I'd love to send her this one to try, may get me an extra visit! Those Foo's look great in your home. 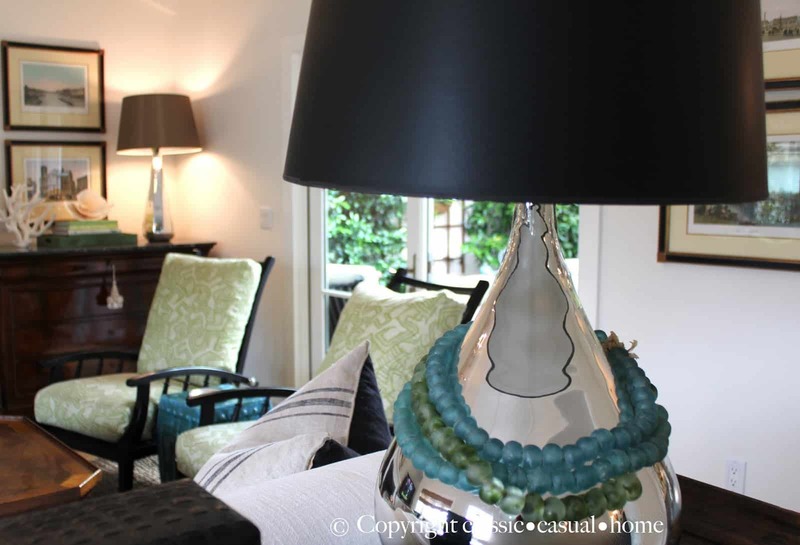 I love the idea of beads on a lamp. I already follow you on FB, and would love to win a copy of the book! LOVE the foo dogs! I have a pair but hadn't thought of using them in the kitchen. So unexpected….and perfect! Love your style, Mary Ann! What a perfect color combo for summer- something new I have to try!! And the book sounds like a fun read- I like light reading in the summer. It's no secret that I love love love the crazy magic you mix up with pillows and throws and accessories. You have such a good eye for doing that! I've never listened to a book on tape (or CD or ipod)…that's a great idea for traveling! 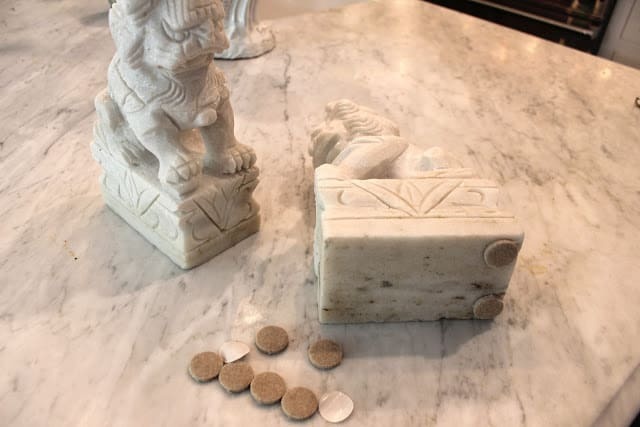 Love the foo dogs; they are great with your amazing marble counters….the combination of the blue and green looks fresh too for summer; I have an indigo but wish I had a nice white sofa to throw it over! Mary Ann, I am smiling at those faces on the Foo Dogs, really funny! 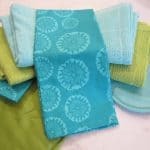 Adore your indigo throw with the green pillows! The Rowan Bracelet arrived and I love it! Perfect for my summer outfits! Thank you son much and for supporting a great cause! The spaces are beautiful. I want to move in! I love the touch of green. Thanks for posting the photos and feel free to drop by me too anytime. Love those little foo dogs! You are such a good shopper! I have listened to another book by Mary Kay Andrews so count me in! I wish I were enjoying the summer in soCA, it's got to be more glorious than the heat in ATL! I've been on the hunt for foo dogs just like that! You find the best "stuff"!!!! 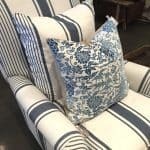 Love the apple and indigo color combo, so fresh and crisp for summer! Think I need to add some "apple green" pillows to my living room! Might have to drive down to The Groves Antique market some time….or maybe just hit the Rose Bowl Swap meet…..it IS right in my own backyard!! Great finds Mary Ann! P.S. Thought of you when we drove by the Mammoth turn off on our way to and from Tahoe! It was gorgeous up there! Love the Foo Dogs, they always reminded me of pugs. Love your burlap pillows. That book sounds like like a fun summer read/listen. What a great idea with the Foos! Sounds like a cute book! Have you picked a winner already? 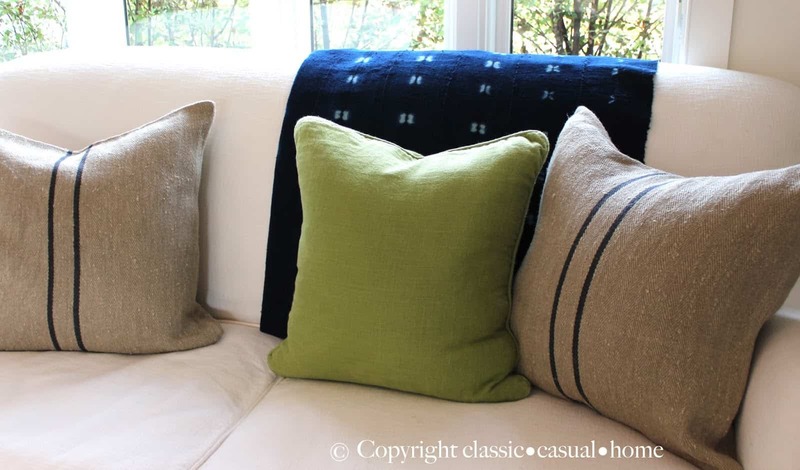 I love the french grain sack pillows! I have some with a red stripe I intend to pull out at Christmas. I would love to win the book!